"This tasty cider is made with cinnamon sticks and cloves. It is an excellent project for elementary school students; second graders love it. Each child can participate by placing cloves in a slice of orange. The project has a yummy ending, and can be prepared in 30 minutes." Cut each orange into 10 slices. Place 3 cloves into each slice. 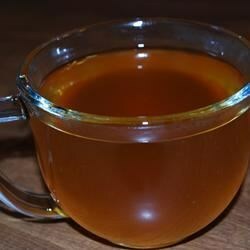 Combine apple juice concentrate and water in a slow cooker. Add oranges and cinnamon sticks. Cook on HIGH for 25 minutes, or until warm. Way to sweet for adults.